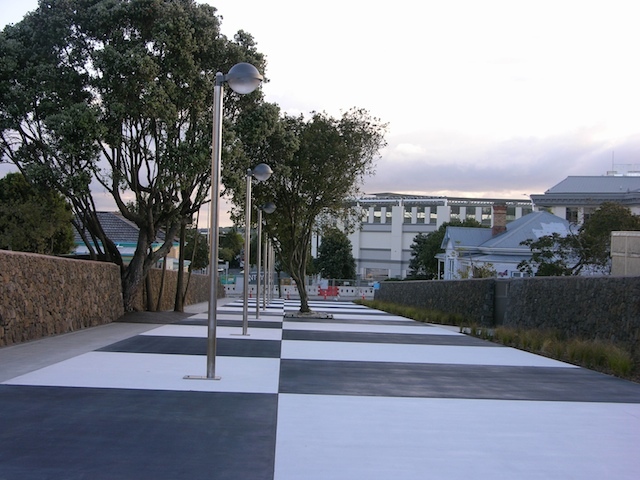 Auckland Transport has advised Albert-Eden Local Board that it will shortly install bollards at the Walters Rd end of the walkway, near Eden Park. There are already bollards at the north end, off Sandringham Rd. Board Chairman Peter Haynes says “Wairepo Swamp Walkway was originally intended as a shared space for both cars and pedestrians but Auckland Transport has continued to respond really positively to the concerns of the Local Board that this would put pedestrians at risk, especially children”. The Sandringham Rd end of Wairepo will still be a ‘shared space’ – for both pedestrians and cars – to allow people to drop off children to the swim school and the learning centre. Auckland Transport will begin ‘soft enforcement’ to educate the public that this area is only for short term parking. Wairepo Swamp Walkway is home to a major work by internationally known artist Billy Apple. Formal public consultations on making Wairepo a permanent ‘pedestrian only’ zone are still to take place.